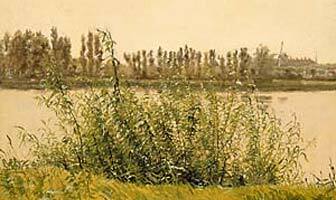 In the depiction of the willow scrub Købke has had the opportunity to show two layers of vegetation: the thin branches of the foreground and the massive poplars in the background. He has made the insignificant plants the main motif, and this very choice gives the picture its meaning. With quick strokes of paint, at some points very thin and transparent, he has conveyed his feeling of intangible movement in the foliage. It is clear that the paint was applied with light, fast movements. The effect is a highly physical one, evoking the light rise and fall of the willow scrub and the quick rustling of the leaves in the light breeze. Købke’s depiction of a random willow bush near his home, at once unassuming and inward, in fact expresses a liberation of artistic subjectivity. In his painting Købke was often interested in small sections of the natural surroundings. His work reflects a tendency, partly influenced by German art theory, that was making an impact on the Danish art of the period. The German philosopher G.W.F. Hegel argued that the artist’s choice of motifs should be quite free. The painter was to depict whatever he felt he could empathize best with. In 1833 the Købke family had moved from the old eastern city ramparts to “Blegdammen” by the Sortedam Lake, then just outside the old Copenhagen city walls. In several studies and paintings Købke gave an account of the scenes that unfolded around his new home. According to the painter’s acquaintances he was totally dependent as an artist on the reality he could observe around him. Without a visible subject he was unable to invent pictures or motifs, so there seems to have been an obvious reason for his thorough registration of the areas around the Sortedam Lake in whole series of drawings and sketches.